Home CDW Introducing Surface Go! At over 2 billion people worldwide, Firstline Workers span across nearly every industry. A company’s Firstline Workforce is the backbone of their company. They represent the corporate brand to the public and ensure operations are running smoothly. Companies can deliver a superior employee experience by empowering their Firstline Workers with Surface Go to do their best work. It’s a great fit across three key Firstline scenarios: Front of house, On the floor, and In the field. And Firstline Workers will love Surface Go because it is the perfect balance of performance and portability, with the power to run full feature desktop software yet light enough to carry with them, all day. Young minds need tools that will unlock their greatest learning potential. Surface Go is a great fit for both Shared Cart and 1-to-1 scenarios. It’s as versatile as the students who will use it. They’ll love the form factor and they can use it across multiple modes – as a tablet for taking notes, reading, or doing homework, or as a laptop with a full keyboard typing experience and trackpad for pinpoint cursor use Teachers and administrators will love Surface Go for their students because it’s a reliable device, running the Windows 10 they know and trust, to keep class time effective. And, it works seamlessly with Microsoft Education tools like Teams, OneNote Class Notebook, Minecraft: Education Edition, and more. From a consumer standpoint, this device is also reaching new audiences – families as a shared device and people on the move. 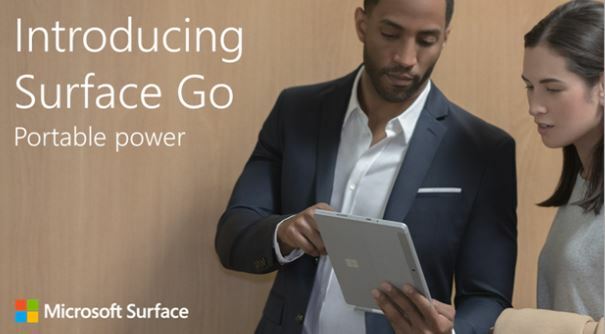 As we think about the story we’ll tell with Surface Go, 4 key messages will shine through our commercial marketing and channel executions. Laptop-to-tablet flexibility that goes anywhere Our lightest Surface yet, new Surface Go starts at just 1.15 pounds. Whether you need a compact tablet on the go or a laptop at your desk, stay connected with optional LTE Advanced (coming later this year). Powers full feature desktop software. Fly through tough tasks, from full feature desktop software to mobile apps you need on the job, with a powerful Intel® Pentium® Gold processor and up to 8GB RAM and 256 GB storage. Sleek, modern, and compact Slim, compact design that doesn’t compromise your productivity. The high-resolution 10” PixelSense™ Display is designed to be touched, viewed, and written on. Empower your workforce with the best of Microsoft 365 — a complete solution including Microsoft Office, Windows 10, and enterprise-grade mobility and security. 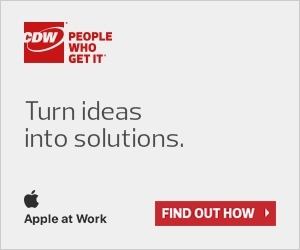 Visit cdw.ca/surface for more information. WEB APPS, WEB SERVERS, AND WEB LOGIC, OH MY! Does Your Phone System Remind You of Two Cans on a String?